There is only one reason why many of you from Morris County, NJ landed on this page, You think you may have a pond or waterfall leak. Please read on and let us help you determine if there is a leak. 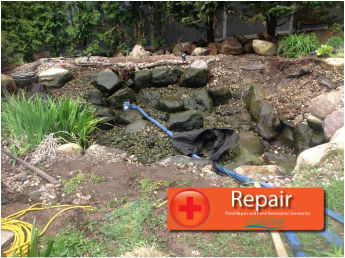 Koi Pond and waterfall leaks are among the most misunderstood and misdiagnosed problems for many of our customers in the Morris County New Jersey area. 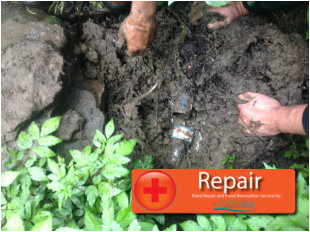 Understanding the basic principles of pond leak detection and repair will save you time, money, and headaches in your water gardening adventures … I guarantee it! The amount of water loss will vary according to the region of the country and the time of year. Ponds that are located in Morris County, NJ can expect to see 1 to 1 ½ inches of water loss per week during the spring and summer. Most of this evaporation should be replaced naturally by rain. However, if we experience high temperatures and low humidity, it’s possible to see 3 inches or more of evaporation in a week. The quantity and size of your waterfall(s) will also affect the amount of water that is lost in a huge way. Regardless of the climate, a 4’x 6’pond with a 20-foot stream and 5 feet of cascading waterfalls may lose as much as 2 inches or more every day! Why? Splashing and moving water has greater exposure to additional evaporation than does the still water in the pond. If that same pond was 16′ x 21′ pond, you’d probably never even notice the additional evaporation because it’s a larger pond. Evaporation is not filling your pond up all the way one evening, and waking up the next morning to find the water six inches lower. That’s a leak! If your pond is experiencing a loss of water at a more rapid rate, you either have a leak, or your frogs are drinking the water. Seriously, let’s figure that it’s a leak. It's not evaporation, What do you do now? Check for low spots: carefully inspect the edges of not only your stream and waterfall, but also the perimeter of the pond. As the dirt around the stream or waterfall settles, it can create low spots that may cause water to escape over the edge of the liner. Keep your eyes peeled for wet mulch or gravel, or muddy areas around the perimeter of your pond. If you find a spot that’s leaking, all you have to do is lift the liner up and push some soil under it in order to raise the edge. Bingo – leak fixed! Obstructions in Waterfall/Stream: This is most common in the mid-summer and fall months. String algae and leaves can accumulate in the waterfalls and streams causing a dam. Check the stream carefully for any objects that may be causing the stream to dam and water to flow over the liner edges of the stream. Once removed you should notice the water not leaking out of a particular area again. Bam!! Leak fixed. Pond or Waterfall Sill Leaking? You've spent some time trying to locate the leak. Fixed a few of the pond or waterfall edges and it's still leaking! Before giving us a call please perform the below test. 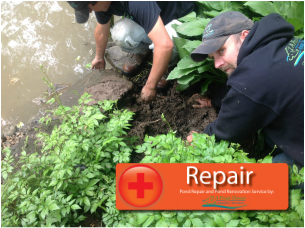 This will allow us to assess the situation and determine how we can help you stop your pond from leaking. Take note of how much the water level dropped in the pond, if at all. Can't Find That Leak? Give us a call or fill out the form, we'd be happy to help!